Standard steel tape. View port in reel to view amount of tape used. Reel diameter 7". 50' x 1/8 x .045". Durable interlocking fiberglass rods. 1/4" diameter for rigidity when extended. 2 different threading tips provided. Three 4' sections in a storage tube. Used to install wires above drop ceilings, through insulated walls and under carpet and floors. Contains three connectable fiberglass rods. Bullet nose and hook attachment included. Full wrap-around ergonomic handle made from tough nylon resin keeps the angle of the users wrist in a straight and locked position to reduce wrist strain. Interior grip is formed to fit the user's palm, reducing the number of pressure points common on most fish tapes. Increased interior ribbing, along with high-impact ABS resin, improves durability to exceed 25' drop tests. Plated carbon steel tape. Used to install wires above drop ceilings, through insulated walls and under carpet and floors. Contains three connectable fiberglass rods. Bullet nose and hook attachment included. 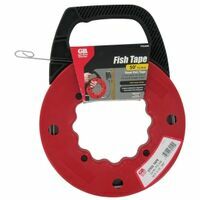 GB Fish Tape, Flat, Refillable, Shatterproof, Series: Streamline, FTS, Deluxe, 1/8 in Width Blade, 50 ft Blade Length, 0.06 in Blade Thickness, 8-1/2 in Diameter Reel, Steel Blade, Winder Slide Case, 500 lb Tensile, For Wire Pulls Through Steel, Aluminum, Plastic Conduit and BX Raceways Full wrap-around ergonomic handle made from tough nylon resin keeps the angle of the users wrist in a straight and locked position to reduce wrist strain. Interior grip is formed to fit the user's palm, reducing the number of pressure points common on most fish tapes. Increased interior ribbing, along with high-impact ABS resin, improves durability to exceed 25' drop tests. Plated carbon steel tape.